After I made this Kale, Mushroom, Feta, and Mozzarella Breakfast Casserole twice for guests I decided to post the recipe, and this delicious meatless breakfast combination is low-carb, Keto, low-glycemic, South Beach Diet friendly, and gluten-free! Use the Recipes-by-Diet-Type Index to find more recipes like this one. 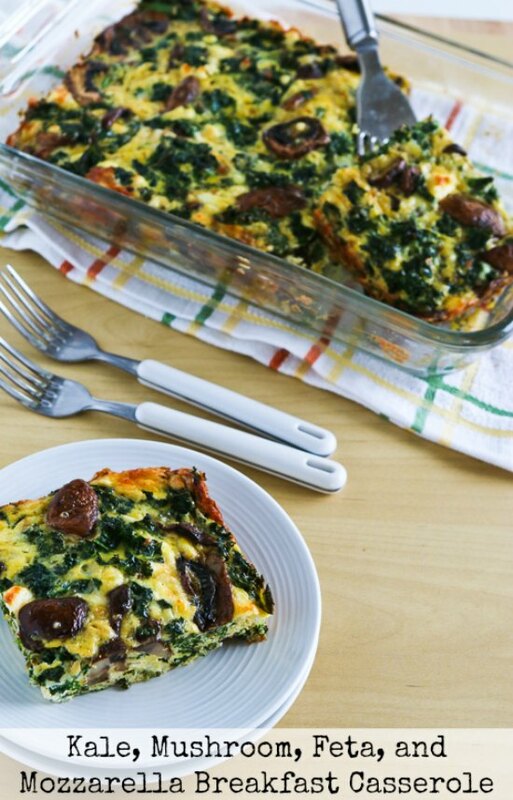 Click here to PIN Kale, Mushroom, Feta, and Mozzarella Breakfast Casserole! But after I’d ad-libbed this Kale, Mushroom, Feta, and Mozzarella Breakfast Casserole twice for guests and people raved about it both times, I decided this was a recipe I needed to post on the blog, and it’s a perfect new recipe for the January when people are getting back on track. Of course this is also a perfect recipe for Meatless Monday, and even though I’m calling this a breakfast casserole, I’d enjoy this for lunch or a light dinner as well. I always like using kale in a breakfast casserole, because kale and other dark leafy greens are the healthiest foods you can eat, and I love starting out the day with a dose of greens. Beat the eggs until they’re well-combined and the pour over the vegetables and cheese. Then take a fork and gently “stir” until all the ingredients are coated with egg and the top of the breakfast casserole has a good mixture of ingredients. (Some ingredients will stick up above the eggs even if you use 12 eggs; don’t worry about that.) Bake at 375F/190C for 35-40 minutes, or until the casserole is completely set and the top is starting to get lightly browned. Serve hot, with some sour cream on top if you prefer. This will keep in the fridge for quite a few days and can be reheated in the microwave or in a pan on the stove for a quick week-day breakfast option! After I made this Kale, Mushroom, Feta, and Mozzarella Breakfast Casserole twice for guests I decided to post the recipe. Wash and dry mushrooms and thickly slice. Heat 2 tsp. olive oil in a large non-stick frying pan over medium-high heat, add the mushrooms, and saute until the mushrooms have released their liquid and it has evaporated, and mushrooms are starting to slightly brown, about 5-6 minutes. Spread out the sauteed mushrooms over the bottom of the baking dish. While the mushrooms cook, chop kale, cutting away the thick stems and chopping the leaves. Wash kale if needed, and spin dry. Add 2 tsp. more olive oil to the same pan, heat to medium high, add the chopped kale all at once and saute, turning kale over and over until it’s all wilted, about 2-3 minutes. (Baby kale will take even less time than this.) Layer the wilted kale over the mushrooms in the baking dish. Beat eggs until they’re well-combined; then pour eggs over the cheese. Use a fork to gently “stir” until all the ingredients are coated with egg and the top of the casserole shows a good mixture of mushrooms and kale. Serve hot, with a dollop of low-fat sour cream if desired. This will keep in the fridge for at least a week and can be quickly reheated in a microwave. Don’t microwave too long or the eggs will get rubbery. Recipe created by Kalyn when she had overnight guests and was winging it with ingredients that were in the fridge. 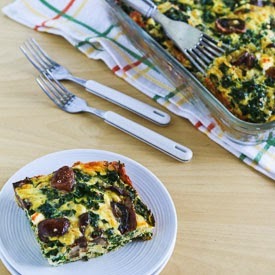 This type of low-carb breakfast casserole is a great breakfast option low-carb or low-glycemic diet plans or for any phase of the South Beach Diet. Add a small green salad and make this for lunch or a light dinner. Late to the party, but I'm wondering if you can prepare this the night before and then bake the next morning? I've never done that, and I would probably saute the mushrooms and kale and refrigerate them; then assemble the rest of the dish the next morning and bake. I say that partly because I think the mushrooms might turn the eggs brown if they sit in the mixture overnight. But it might work; would love a report back if you try it! That makes sense, I will probably do it that way. Thanks so much for the reply!! Could you use spinach in place of kale? Ashley you can definitely make this with spinach. The spinach will take even less time to wilt when you saute it, probably less than 2 minutes. Hope you enjoy! When I frist started making this kind of dish I used to cook/freeze/reheat sometimes. But when eggs are frozen they give off a lot of water when they're thawed, so now I prefer to cook and just refrigerate the leftovers. If you're talking about freezing the uncooked mixture, I don't think that will work. This sounds delicious and healthy. Have you tried freezing it and then cooking it the morning of? Just wondering how that would come out. Hi Kalyn! My family is making this for dinner tonight & adding veggie burgers in the mix. Looking forward to this dish. Thanks for creating! Greens are always sold by weight when they come in a package, which is why I gave the measurement that way. Seems like the photos would have shown it was far more than 1 cup, sorry you were confused. It would have been helpful to know that 8 oz. kale is 4 cups, not 1. Kim, you probably can but the ingredients will need to be adapted a little. This Slow Cooker Frittata can help you with the timing and other needed changes. Could you make this in a slow cooker? If so, how long would you cook it? Thanks Joanne; these are definitely some of my favorites. I love eating breakfasty things at all times of the day! This sounds like a great combination of ingredients! Love it when you can pull off such a great dish using whatever's in the fridge. I could make a dish of this and eat for breakfast all week! I could eat this combination every morning for breakfast. Whenever I get my dark leafy greens in first thing in the morning, I feel powerful for the rest of the day. Thanks Nick! I know I've made it at least 5 times since I dreamed up this combination.